Which season finale is your お気に入り for Spike? what do あなた think is the sweetest thing that Spike has ever done for Buffy? Their relationship was complicated. It was raw and edgy. It was desire. It was to want and to be wanted. But not necessarily need. It was lust in the very shallow pits of the word. Spike was madly in 愛 with Buffy, and changed for it, to make him the man he wants to be in Buffy's eyes. Buffy denied it all. She couldn't possibly be in 愛 with a vamp without a soul. Okay, so far got a couple of users want to 登録する the "Spuffy Competition".. Thank あなた for particating. Now just finished my thoughts for questions.. I've been having this feeling that this event will happen with out no interruptions または delays.. Thank あなた for thoses that I want this event.. I can really tell that あなた want a Spuffy Oscars, Graphics Contest, & QUESTIONS..Too. 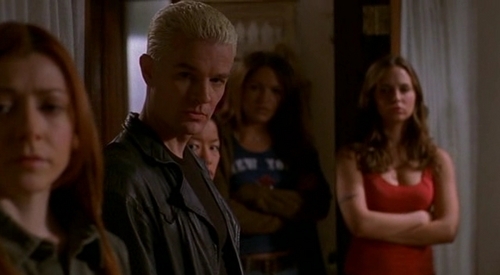 1) What episode does Spike 表示する his appearance to Buffy? I've recently been looking on ランダム websites for 記事 about BTVS, just to read other people's opinions. I've found out it just isn't a great thing for me to do, as I find myself so worked up によって people dissing Spike's character, stressing him as the major element in the downfall of BTVS. This website, for example, claims that Spike is a "too-cool thug in a leather jacket" who "has diverted a good 表示する from its original mission: To celebrate the uncool outcasts of the world." I'm bored and just in case あなた didn't already know (if that's the case then where ave あなた been?!?) But James Marsters is going to be in Torchwood (the BBC Dr Who spin off. From the adverts I have seen he has an English ascent again. It looks like he is playing 'rogue Time Agent Captain John Hart' who Captain Jack knows. a comment was made to the poll: Spike または Angel? a comment was made to the poll: Do あなた think Dawn and Spike Should have happened? a comment was made to the poll: In The Gift why do あなた think Spike falls to his knees?